With a 5-3 decision in Whole Woman’s Health v. Hellerstedt, the court reversed a decision by the 5th Circuit Court of Appeals, which had upheld the law. Justices Samuel Alito, Clarence Thomas and Chief Justice John Roberts dissented, while Anthony Kennedy joined the liberal justices in the majority. “First, it requires that all doctors who perform abortions have admitting privileges at a hospital within 30 miles of where the abortion takes place. But because the complication rate from abortions is so minuscule, most abortion providers cannot meet the minimum number of admittances that hospitals require before granting privileges. “Second, the law requires that abortion clinics be retrofitted to meet elaborate statutory hospital-grade standards, including wide corridors, large rooms and other expensive construction and equipment standards that do not apply to all other outpatient facilities where other surgical procedures like liposuction and colonoscopies take place. 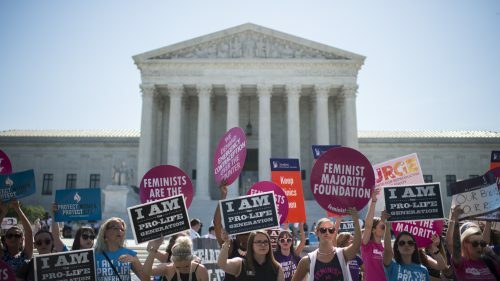 The state said the provisions protect women’s safety; medical groups like the American Medical Association and the American Association of Obstetricians and Gynecologists say the law in fact impedes safety, Nina has reported. The Supreme Court rejected that decision, and ruled that both provisions constituted an undue burden, and are therefore unconstitutional. This entry was posted in KRTS News and tagged abortion, HB-2, SCOTUS, Supreme Court, Texas Abortion Law. Bookmark the permalink.